Where Now For The Foos? 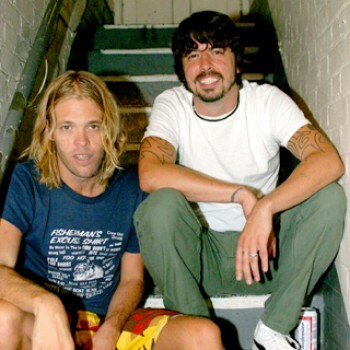 Backstage at the Mean Fiddler Dave Grohl and Taylor Hawkins revealed all to NME about the Foo Fighters future. Dave: "The crazy thing about the show tonight was knowing that this is the last time we were going to play London for quite a while. As we were playing I was thinking, 'Wow, we're not going to see these places for quite a while.' It was a nice way to send it off, playing songs we haven't played in quite a long time and blowing up our equipment! Taylor and I live about five miles away from each other, Taylor’s got a studio in his basement, I’ve got a studio at the house in Virginia and I’m building a studio in my house in LA. "My wedding day was my perfect day. I spent the night at Taylor's the night before. We woke up in the morning, had a big breakfast, had some bacon and some eggs. Sat by the pool for a little while with a couple of cups of coffee, went to the studio and jammed for an hour or two, came up with a bunch of new riffs. Went back to the pool and had a barbecue and went ot my wedding. Even before the wedding it was one of the greatest days of my life! I see a lot of these days in the future, in the near future." Taylor: "We both have little studios set up. We’re coming up with all these riffs now. We have six riff-things floating around and I think one or two of them will make it into a bridge, or part of a record. We need to do 30 or 40 things before we decide on those ten. We always think we’re gonna make a ‘White Album’, a 20-song thing. But at the minute it’s good to listen to the riffs and see what we’re going to sound like on the next record."